On The Amazing Race last night (episode 4), teams flew from Scotland to Copenhagen at the start of the next leg of the race. Today’s track is located lass than a half mile away from the airport. 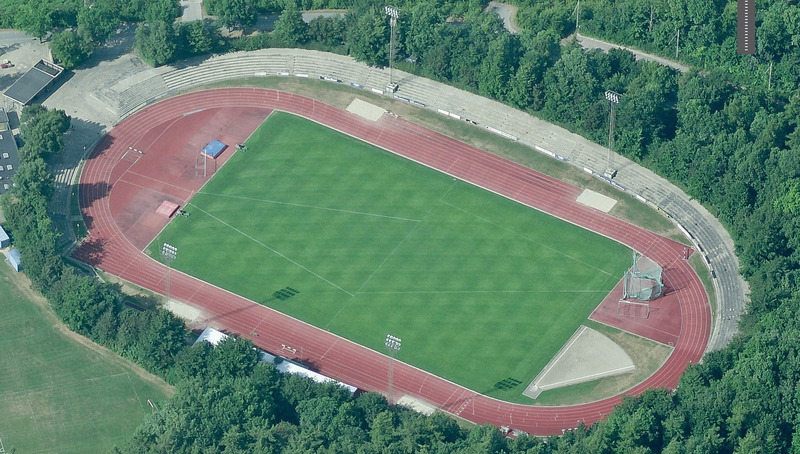 Tårnby Stadion was built in 1961 and renovated in 1975. It now has a Tartan surface that was installed over the old dirt track in 2006. It is the home facility of the Amager Athletics Club, that was founded in 1933. The design is typical for European tracks, and is very nice. All field events here, except for the long and triple jumps, are located on the inside of the track. There are two runways with big sandpits for those events found just outside both straightaways, which is really nice They only have six full lanes here though, but have two additional lanes added to the main straightaway for the sprints and hurdles. The infield in the Bing photo is marked for the throws, but it also gets used for soccer.